Glass Notice: After months of education and analysis, the County is moving in the direction of enabling the removal of glass from the recycling stream. As the next step, the County Manager is proposing an amendment to the Chapter 10 (Trash, Recycling and Care of Premises) County Code that will allow for the removal of materials from the “Recyclable Materials” list. Currently, the County Code only allows the Manager or his designee to add materials. 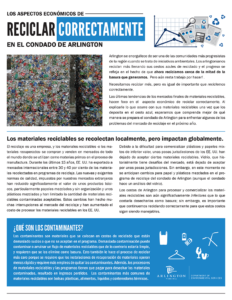 Today, glass recycling in Arlington is no longer fiscally or environmentally sustainable due to: lack of regional glass processing capacity and end-markets; difficulty in producing clean and marketable glass in the single-stream recycling sorting process; and high transportation costs. Local recycling processing facilities are no longer accepting glass and it ultimately ends up in the landfill. The proposed FY 2020 Household Solid Waste Rate includes savings from the diversion of glass. What’s happening with recycling? Why did I receive the cart hanger? The cart hanger is being distributed to residents with curbside collection services this week in order to provide some context on the economic issues impacting recycling markets and to provide updates on our own program. 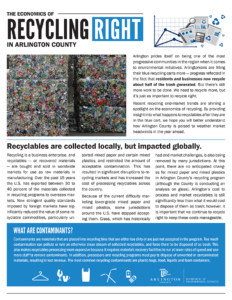 During the past few months Arlingtonians may have read or heard stories from news outlets such as the Washington Post, New York Times, Bloomberg, NPR, etc., about the economics of recycling in the U.S. and across the globe. Recycling programs across the U.S. – even here in Arlington – have been feeling an economic pinch ever since new stringent quality standards and bans on imports of some recyclables were imposed by China earlier this year. Arlington County historically has earned revenues from the recyclables collected in the curbside recycling program, but in Fiscal Year (FY) 2018 paid an average of $4.66 per ton to have recyclables processed and shipped to end markets. That amount has risen to an average of $16.31 for the first three months of FY 2019 (July-August-September). Recycling is facing some challenges, but still delivers significant environmental benefits through conservation of natural resources and energy savings for manufacturing. It also provides cost-savings benefits for Arlington County as the cost to process and market our recyclables is still significantly less than what it would be to dispose of them as trash ($43.16 per ton). While market watchers expect pricing to stabilize, we anticipate that we’ll continue to have to pay for recyclables processing for the next year or two. I keep hearing about China. What role do they play in recycling? Recycling is a business enterprise, and recyclables – or recovered materials – are bought and sold in worldwide markets for use as raw materials in manufacturing. As recently as 2017, some 35 percent of all recyclables collected from programs in the U.S. were shipped to overseas markets, with most of those bound for China. Exports to Chinese markets took off in the mid-2000s as programs around the U.S. switched to “single-stream” or all-in-one recycling, where all recyclables can be mixed in the same container. The Chinese government started to impose more stringent quality standards on imported recyclables almost five years ago, and last year began to drastically scale back on the number of import licenses granted. These actions were undertaken in order to force exporters to deliver cleaner materials and to boost China’s own fledgling recovered materials industry.U.S. recyclables exports to China have fallen off dramatically in 2018. Other markets are beginning to emerge or develop, including in Southeast Asia. There are also renewed efforts to build more recyclables end-markets here in the U.S.
What is the impact to recycling in the U.S.? All of this has caused significant market disruptions as recyclables processors look for new markets to sell to and as they spend more money to produce cleaner materials. Many materials recovery facilities (MRFs) have had to make expensive investments in additional sorting systems and technologies, hire more staff and reduce the speeds on production lines in order to ship higher-quality materials.Because of the costs associated with meeting new quality standards, and the low (and sometimes negative) market values of some materials, some recycling programs have stopped accepting certain recyclables, most notably lower value mixed plastics, mixed paper and glass. What is the financial impact in Arlington? Arlington County historically has earned revenues on the recyclables collected in our curbside recycling program. However, for FY 2018 the County paid an average of $4.66 per ton to have our recyclables processed and shipped to end markets. That amount has risen to an average of $16.31 for the first three months of FY 2019 (July-August-September). But, even though we are now paying to have our recyclables processed, that rate is still far below the $43.16 fee the County pays to dispose of its trash at the waste-to-energy facility in Alexandria. The County is helped by the fact that we have a long-term contract for processing our recyclables, which spreads risk out over multiple years, and helps protect us from more drastic pricing fluctuations. While recovered materials market watchers do believe that the current market conditions will remain in play for the next couple of years, they also believe that the prices have bottomed out. Will my household solid waste rate increase because of this? There are no planned increases to the household solid waste rate. However, commercial businesses and multi-family properties may already be seeing increases in their trash and recycling service fees. Will the recycling program in Arlington change? There are no anticipated changes for recycling metals, plastics, paper and cardboard. However, the County has received the OK to promote placing glass in the trash over disposing it in the blue recycling cart. Glass has historically held a negative market value due to the lack of regional glass processing capacity and markets, the difficulty in generating clean glass in the single-stream recycling sorting process, and high cost of transporting it. Indeed, for most of the past 15 years, glass has not been recycled in a traditional sense, but instead “down-cycled” or beneficially reused as either daily cover at area landfills or as road base at these same landfills. Today’s reality though is that the glass is being disposed of directly into the landfill and no recycling or beneficial reuse is being achieved. The County will most likely begin promoting this change sometime this fall. While it will be OK for residents and businesses to place glass in the trash, the SWB will be adding glass-only collection containers at the County’s two recycling drop-off centers. When the glass containers are full, they will be hauled to Fairfax County where the material will be recycled at Fairfax County’s glass processing plant, a facility that accepts clean and source-separated glass. The glass will be processed at the plant and used as a substitute aggregate material for roads and streets. Are we going to change back to dual stream or curb-sort recycling? No. Single-stream recycling has been a great innovation in recycling. It has lowered collection costs which has brought tens of millions of Americans into recycling programs. However, single-stream recycling has also made us – residents, businesses, recycling processors and end-users – a little less diligent about recycling the right way. Recycling right will be the focus of much of our outreach in the coming months. What has been the biggest change to our recycling stream? The number of products packaged in plastics has grown tremendously. Not all plastics – especially things like plastic bags, film, and Styrofoam – are recyclable in curbside recycling programs, but many product and package labels often lead well-intentioned people to believe that they are. This can decrease the quality of the recycling stream.Unfortunately, the responsibility for sorting out how to recycle many of these materials, and how to educate the public on them, has been borne by recycling processers, end-users, and local governments, instead of brands and packaging designers. Also, the make-up of our recycling stream has undergone rapid transformations. Twenty years ago, paper and cardboard combined to make up around 75 percent of the weight of a typical ton of curbside recyclables. Today, that number is closer to 50 percent due to the influence of digital media and shrinking newspaper and magazine subscription levels. Place recyclables loose in the blue recycling cart, your own personal container, paper bags or in cardboard boxes. Acceptable items include: paper and cardboard, plastic bottles, jugs and containers, metal cans and aluminum foil and trays. Check out the Where Does It Go Directory for sorting help. Make sure food and beverage containers are empty before placing them in the cart. Do a quick rinse for recyclables that contain a thick residue like peanut butter or spaghetti sauce, or wipe with a paper towel. Keep food-contaminated paper such as napkins and paper towels out of the blue carts . The same goes for pizza boxes that are soaked in grease. Dry and relatively grease-free pizza boxes are acceptable. Look for products that come packaged in easily recyclable materials like aluminum and steel cans, plastic bottles (for soda, water, juice, milk, detergent, shampoo, etc. ), and cartons (milk, juice, soups, etc. ).